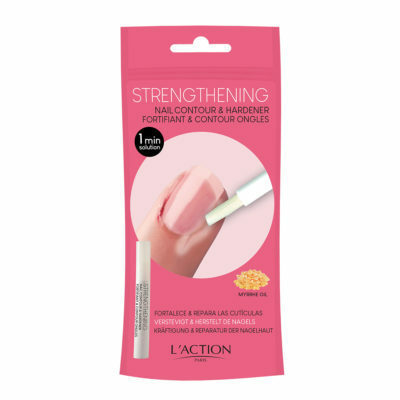 Containing myrrh, well known for its regenerating and strengthening qualities, shea butter and soothing and emollient plant extracts, this unique formula repairs the nail area, encourages skin renewal and hardens nails. AQUA (WATER), CETEARYL ETHYLHEXANOATE, GLYCERYL STEARATE, GLYCERIN, BUTYROSPERMUM PARKII (SHEA) BUTTER, HYDROGENATED PALM/PALM KERNEL OIL PEG-6 ESTERS, CETEARYL ALCOHOL, PARAFFINUM LIQUIDUM (MINERAL OIL), CETEARETH-20, CETEARETH-12, PRUNUS ARMENIACA (APRICOT) KERNEL OIL, POLYSORBATE 20, PHENOXYETHANOL, DIMETHICONE, XANTHAN GUM, CETYL ALCOHOL, CHLORPHENESIN, METHYLPARABEN, BHT, TETRASODIUM EDTA, CITRUS AURANTIUM BERGAMIA (BERGAMOT) FRUIT OIL, PROPYLPARABEN, COMMIPHORA MYRRHA (MYRRH) RESIN EXTRACT, LAVANDULA ANGUSTIFOLIA (LAVENDER) OIL, ETHYLPARABEN, CITRIC ACID, MENTHA PI, CITRUS LIMON (LEMON) PEEL OIL, LINALOOL, LIMONENE. Using the brush, apply to problem areas and massage in. Use two to three times a day until full repair. Avoid contact with eyes.